that settled in Illinois and Missouri. A high-protein rice variety developed by LSU AgCenter rice researcher Ida Wenefrida is being grown for commercial production in southern Illinois. Shanghai Farms obtained exclusive rights from the AgCenter to grow the Frontière variety, Wenefrida said. 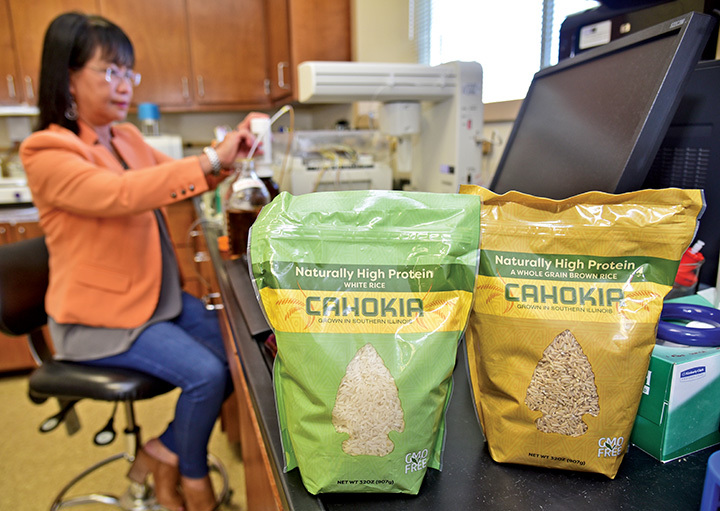 Wenefrida said she first had the idea of a high-protein rice when considering the nutritional possibility of using grain to help people improve their diet with more protein. “Rice is the staple food for close to 500 million people around the world,” she said. However, people in developing countries often cannot afford meat and other sources of protein, she said. Wenefrida developed Frontière from the Cypress variety using mutational breeding and spent seven years refining the variety. Wenefrida said the rice has a protein level of 10.6 percent, compared to the level of 7 to 8 percent found in most rice. She said the rice is being sold under the name Cahokia, which is the site of a pre-Columbian Native American city in Illinois east of St. Louis, Missouri. She said most of the Cahokia rice is sold to restaurants in the St. Louis area, and customers seem to prefer it because of its softer, creamier texture. Wenefrida said LSU AgCenter molecular biologist Herry Utomo is working on a genetic marker to identify rice lines with high protein levels to help develop more lines with this trait. LSU AgCenter nutritionists also are looking at flour made from Frontière rice to explore its use in baking. Rice is naturally gluten free, and the higher protein level makes it attractive for baking items. Wenefrida also wants to improve the yield potential. Currently, Frontière produces about 6,000 pounds per acre or about 34 barrels or 120 bushels. More information about Cahokia rice can be found at the company’s website, www.cahokiarice.com.